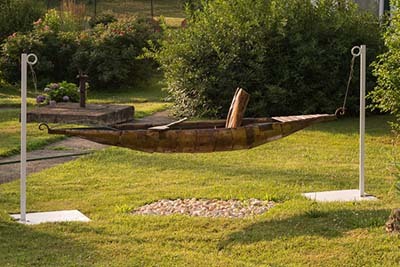 For years I have been fascinated by African, primitive and outsider art traditions. One of my favorite pieces is an old wooden Baule sculpture of a Gbekre (baboon) patron deity who looks to the heavens while guarding the yam crop. But it was after a visit to an installation from Howard Finster’s Paradise Gardens that I dreamt of making surreal cement structures and fantastical creatures to inhabit my own family’s gardens. A small ceramic rabbit led the way, and while birds have flown in and out of my work, the rabbits keep returning and multiplying under the roses. 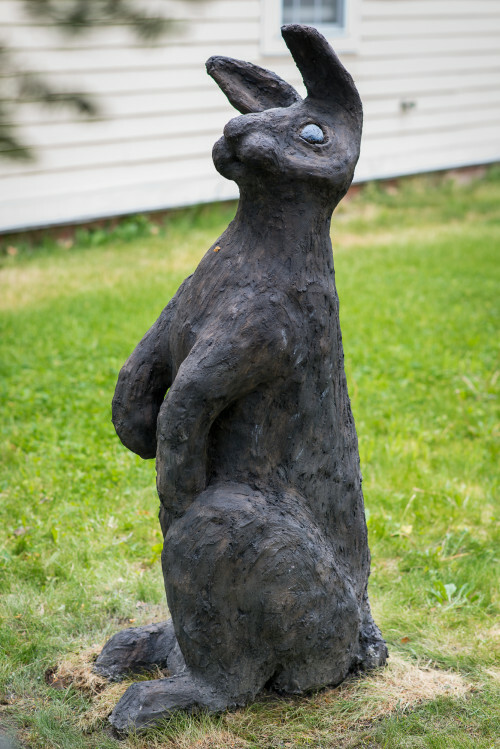 This piece, Rabbit, is made of polymer sculpture cement over a styrofoam armature. It is finished with a concrete stain and sealer. Judith is a student and ceramics studio assistant at Garrison Art Center. For the last three years she has attended summer workshops offered by the Massachusetts College of Art and Design studying with Joyce Kozloff, Ann Agee and Sally B. Moore.